Taj Hotels Resorts and Palaces is one of the leading luxury hotel brands in India with over 93 hotels in 55 locations across the country. In addition to the national portfolio, the brand also has around 16 hotels in international locations. Being a luxury brand, it is not surprising that majority of the followers lie in the age bracket above 30. It is mostly followed by men, with a relatively low share for females. As happens with most luxury brands, the emphasis in the social media strategy of Taj Hotels is more on the experience of being in Taj and the services rather than anything else. This is enhanced with a pan social media presence, courtesy of spaces in several social media platforms. A major hit in terms of social media is their website and the way with which they have organised outreach. So if you wish to like the Facebook page of a particular hotel, the website takes you there. This is step one of social media outreach fulfilled – leading your audience to your social media space. On Facebook, almost each and every hotel of the chain has a separate page. The frequency of posts is optimum, generally talking about offers and services. Many a time, there are also posts to sell that product effectively. They have taken hashtags seriously and usually add appropriate hashtags to their posts. Majority of the posts happen to be photos, with small descriptions coupled with hashtags and shortened links. The responsiveness is on the page is decent with customer complaints and as well queries being addressed. Both comments as well as user posts are given importance on the page. Moreover, if in case you thought Hindi wasn’t leisurely enough, the page surely proves it wrong. So while the main page emphasises on services, hotel specific pages have posts relevant to the locality and the theme/events happening at the hotel. 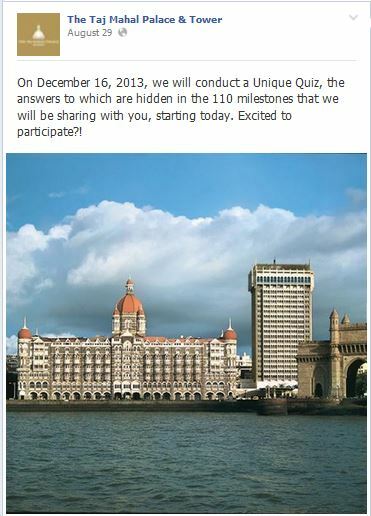 For instance, a Taj Safaris page talks about Wildlife, and a Taj Palace and Tower, Mumbai Page creates an elaborate quiz. 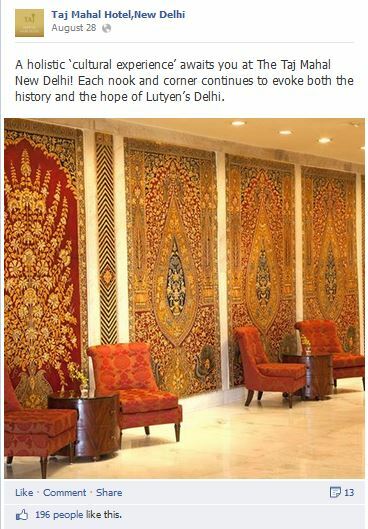 The Taj Mahal Hotel, New Delhi shares photographs of the place to create an essence of luxury. The brand’s activity of Twitter is fairly good with the platform being used for some great engagement with customers. However, the follower count does not reflect all that. The prime variable in this is the fact that most of the tweets are replies or conversations with customers. There are extremely few occasions when the brand itself is initiating the discussion. 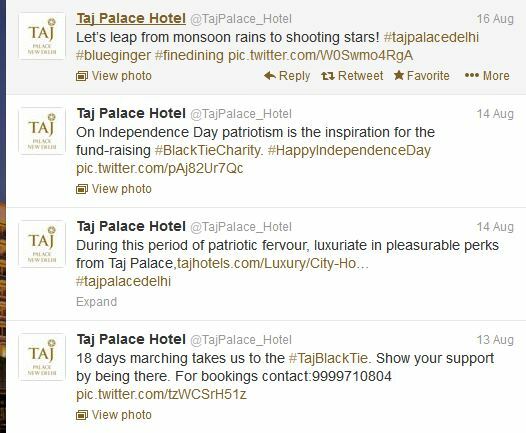 Adding to this, there is not much of retweeting amidst the various Twitter accounts of the Taj brand of hotels. However, the response time and the level at which they engage with the client is surely praise worthy. 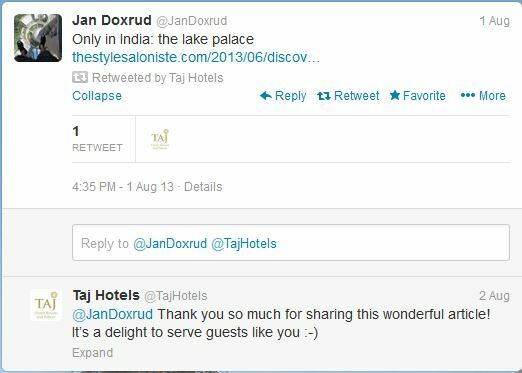 The number of retweets or favourites that @TajHotels receives isn’t that high. The reason for this as mentioned earlier is the extremely low number of tweets that are not replies/retweets. Even these are generally tweeted with a photograph. This concludes the fact that not many text only tweets that are not replies are generated from the account. Otherwise, if activity happening on other Twitter accounts of Taj is taken a look at, each one of them has a different strategy. For instance, Taj Palace Hotel, New Delhi (@TajPalace_Hotel) is extremely negligent about interaction and tweets only about themselves (that too not very frequently). 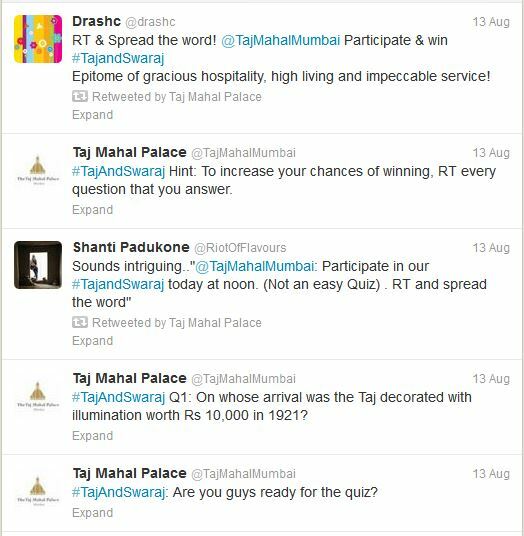 On the other hand, Taj Mahal Palace, Mumbai (@TajMahalMumbai) stresses on interactivity with campaigns such as a #TajAndSwaraj quiz contest that was held during Independence Day. Perhaps, the usage of such tools might also be a reason why it’s Twitter account has more followers than the main @TajHotels Twitter space. Also, while a few hotels have their Twitter accounts, (e.g. 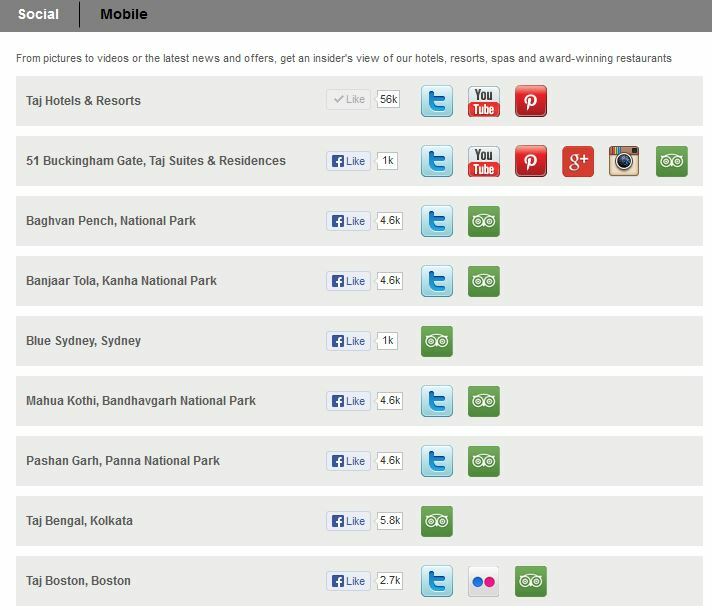 @TajLandsEnd in Mumbai) they are not listed on the Hotel Website. The brand’s usage of YouTube though limited, but is surely interesting. Since, there are around 20 videos in total, surely there is less amount of content available and this reflects on the number of views and subscribers as well. In terms of cross platform usage also, while these videos are often shared on Facebook from time to time, not many are tweeted from the Taj Hotel’s accounts. The production quality of the videos is extremely good and the fact that they are well made and well documented stories makes it a great type of content to use on your YouTube Channel. While there are videos that tell about specific hotels, there are also several about Wildlife and the movement for Tiger conversation. The one below, follows a documentary style and indirectly promotes the brand as well. For a brand like a luxury resort or a hotel, Pinterest surely happens to be a great platform to use the visuality within the idea of luxury. Hence, it has great potential. Firstly, the Taj Hotels website redirects you to a broken Pinterest link. Secondly, once you land up on Pinterest and find the correct profile with a quick search, it happens to be a not so active one. There are roughly five boards for five different hotel destinations. And a total of around 40 pins. 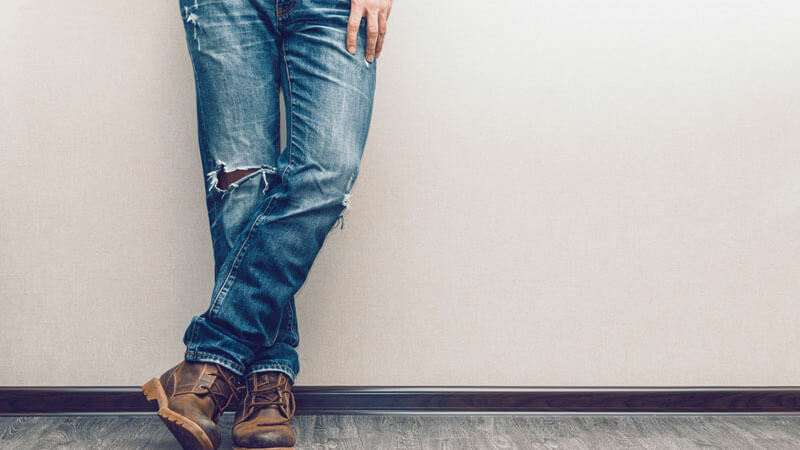 Though using Pinterest for a visual tour of your hotel and the destination is a great idea, it is not being used in the best way by the brand. While international branches of the brand have explored social media spaces such as Instagram, Flickr and Google+ as well, none of the Indian outlets have reached out to audiences through them. However, all of them have a presence on TripAdvisor and according to the purpose, that is an important place to be at. The Oberoi Group of Hotels is one of the leading competitors of the Taj Group and when taken a look at their social media strategy it is apparent that Taj has a lot to learn. Both have multiple Facebook pages and Twitter accounts, but Oberoi uses these for cross sharing. As in, a post made on Oberoi, Gurgaon or Oberoi, Kolkata’s Facebook page, is shared on the main one. This magnifies the presence of all the spaces. However, one lacking aspect from Oberoi’s side is responsiveness from the brand on Facebook. The brand does not respond to customer queries in comments, but answers/engages when posted as a user post. Another interesting aspect is the usage of a Facebook app for reservations, something that Taj isn’t using. On Twitter again, both share a similar style, but Oberoi is way ahead in terms of follower numbers. The idea of doing Tweetups with concierges across the globe is an innovative idea again. When the sentiment analysis for the two is done, Oberoi scores more by generating greater positive sentiment. Oberoi’s active presence on Pinterest is another thing that Taj should be concerned about. Moving to Google+ and YouTube, while Oberoi is there, the activity is negligible. Hence, the major competition here becomes the idea of presence that Oberoi has created through it’s social media strategy. Also, through posts that talk about their staff and Tweetups where people can directly interact with the hotel’s concierges, Oberoi is taking the concept of interaction a step ahead. 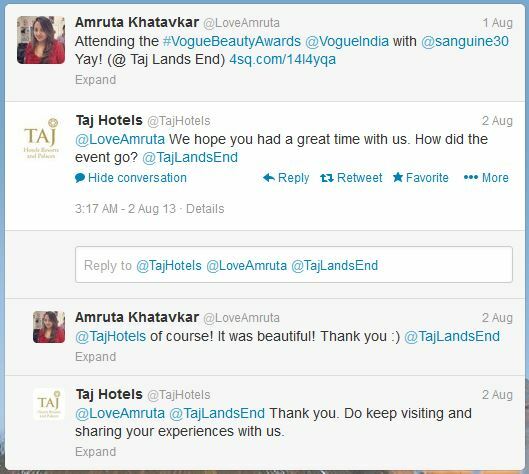 The fact that Taj Hotels has established a well branched social media system is good for the kind of service that they provide. Yet, at the end of it, there needs to be a collaborative identity that emerges out of the process. So, if there is a space about the overall brand name, it should engage with various branches of that brand. Moreover, while they are using Facebook to promote offers, other platforms are not being used for simply selling. If they can take a tip from their competitor and incorporate applications that help users and also work on one on one interaction with their staff, there might be greater sense of dialogue initiation from them. Sharing user experiences and not just reviews or celebrity experiences might be another interesting approach. Since, creativity is not a constraint, it is well defined strategies and campaigns what the brand is lacking now. Though they have the basics right, those ‘special’ elements such as the quiz organised by Taj Mahal Palace, Mumbai are less in number. Taj as a name spells luxury. Ive had the good fortune of staying in many of their properties across India and clearly their service is impeccable but what disappoints me is their activity across social. 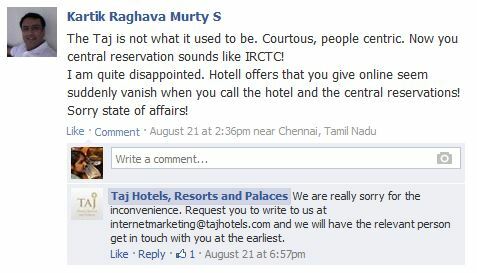 Taj as a brand name can be more customer centric using social media and be very interactive as well. After all for the hospitality industry good social word of mouth is a key indicator of how good one is offline as well. Overall their social media is well organized but the content strategy and the engagement strategy is still a bit dated. It seems like Taj needs to keep up with the dynamic world of social media and up its content and engagement strategy if it needs to stay relevant in the current scenario.